Hello everyone. I wanted to discuss some things that have been happening and shown to me to me during my most recent energy healings. They are absolutely amazing. My third eye is open and I have been shown so much during these energy healings. Please note that I do not heal anyone. I am a simply a conduit where I channel and bring in Source energy through my crown chakra, through my bodies (etheric, physical, mental, emotional, and spiritual) and chakras and meridians and out of my palm chakras into the person that is being healed. This is done through the help of the many high light beings, Arch Angels, master guides and Ascended Masters. The energies are then sent to the person that I am healing and the energies will do for that person what is for that person’s highest and best good consistent with what that soul has chosen to learn, experience and also based on what lessons still need to be learned as well as any karmic imbalance that may be present. With that said, here is what I have recently experienced and seen during the energy healings. This post is only one part of what I have been shown. Other posts will follow in the next few days explaining more of the visions and experiences. So here is what happens and what I see after I invoke all my invocations, bring in the Arch Angels, and Ascended Masters and other high light being, and after invoking protections from Arch Angel Michael and the violet flame. When I perform the distant energy healings, I have a couch in my apartment where I envision the person I am healing lying on this couch. I have been shown to place a giant healing crystal underneath the couch and energize the crystal so the healing energies come from the bottom of the healing crystal. I do this with every energy healing. Then, at the start of every healing, I have been shown that I need to bring in the Metatron Cube by calling upon Lord Arch Angel Metatron (which I always do) and place the person that I am healing within the center of the cube, where the love energies reside. Once this is done, I was shown to place the Merkabah Star over the Metatron Cube so the Metatron Cube is inside the Merkabah Star and the person I am healing is inside the Metatron Cube. Then I was shown to place the Cho Ku Rei Reiki symbol at the bottom of the Merkabah Star and the Sei He Ki Reiki symbol at the top of the Merkabah Star. The Cho Ku Rei is a symbol that depicts a particular energy, and corresponds to the Focus kotodama. The kotodama refers to the Japanese belief that mystical powers dwell in names and words. Reiki has Japanese origins from Master Usui. This Cho Ku Rei kotodama produces earth energy. The Ki energy that is produced from the Earth is heavy, firm and very powerful. It grounds the body and mind, giving mental and physical strength. This Earth Ki is forest green and links the body to the earth. The Sei He Ki is a symbol that depicts a particular energy and corresponds with the “Harmony” kotodama. This kotodama then produces heavenly energies. Energy that emanates from heaven is light, etheric and passive. The heavenly Ki increases intuition, psychic ability and mental focus. The heavenly Ki is golden in color. The Sei He Ki generates higher frequency energy than the Cho Ku Rei Ki and is used to balance the mental and emotional planes. So I am shown to draw both keys over the body. Again, the Sei He Ki over the Merkabah Star at the top and the Cho Ku Rei Ki at the bottom of the Merkabah Star. 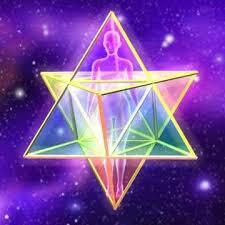 I was then shown how to let these energies from these two keys flow into the Merkabah and into the Metatron Cube. This energy flows into the center of the Metatron Cube, where there is nothing but love allowing the healing energies to engulf the person being healed. So this now sets the stage for the healing. The Metatron Cube is placed over the body of the person being healed, the Merkabah Star is placed over the Metatron Cube and then the earth and heavenly Reiki symbols are placed above and below the Merkabah star. In addition, I was shown to place the Metatron Cube, Merkabah Star and the heavenly and earth keys onto each major chakra of the person being healed in the same way that is described above over the entire body. Once this process is done, which I do for all my healings, I bring in Arch Angel Raphael, the master healer and my close and dear friend that I love so very much. He sets the background for the energy healing which I will discuss in the next post. You do not want to miss the next posts. Continue reading below if you are interested in a free energy healing from me. We are in some beautiful shifting times. Stay happy and in love and know that you are the Divine Presence!! Copied your excellent blog to the Grillflame Healing Forum. Personally, have a recurring problem with sciatic nerve pain and would be thankful to receive some relief. Its me..suzanne…and I just wanted to thank you for explaining this so beautifully to us..esp those of us trained in Usui Reiki ( Masters), energy healers etc and also those working with their Merkabah Star..as well as sacred geometry Lord Metatron,etc. You are amazing in how you have been following your incredible guidance on how to ste these up for us…and allow these healings to take place thru you for each one of us in exactly they way we need and for the Highest and Best. And, of course a lot more is going on between you and the receiver of the healing as it is a multdimensional process that also flows between all involved. So, it must be so fulfilling and expansive for you ongoing. How exciting. We look forward to the remaining parts you will share with us here. And, I will be replying to our last exchange by email also this weekend. So much happened this week that needed a little time to do that as I would like and thank you for it as it really touched me deeply. And, I am so looking forward to my healing at the end of this month which will be timed perfectly with your Bday so we can celebrate that even if the healing will be happening between us at a distance in our own sacred spaces and heart portals of love. I so very much appreciate you and all you are doing…and look forward to connecting with you via skype in next couple weeks to prepare for the reading. What do you mean by the metatron cube? Is it just a large cube with the body in the center? I’m a little confused. interested in reading about the powers of the Reiki symbols and the other symbols. What is your rate of healing on your people? How successful are your healings? Can this technique be applied to self healing? This entry was posted on January 16, 2014 by Andrew Bojarski in Andrew's Posts and tagged Arch Angels, Ascended Masters, Ascension, Awakening, Chakras, Channeling, Energy, Energy Healing, Healing, Higher Self, Love, Meditation, Spirituality.